St Innocent Cathedral is located at 4th and Turpin, between the Glenn Highway and Debarr Rd. Exit at Turpin Abe. Follow Turpin and the Cathedral will be on the left hand side of the road after a few hundred yards. 8:30 AM Hours, 9:00 AM Divine Liturgy. 6:00 Liturgy of the Presanctified Gifts. Confessions are heard during evening Vespers or Vigil. St Innocent Orthodox Cathedral was consecrated in 1994 asuthe Bicentennial Cathedral of the Orthodox Church in America commemorating the arrival of the first Russian Orthodox Missionaries in Alaska in 1794. As Anchorage is the largest city in the state of Alaska, the hub of economic life and public services, the Cathedral is the focal point for many activities in the life of the Alaskan Diocese and its 91 parishes. 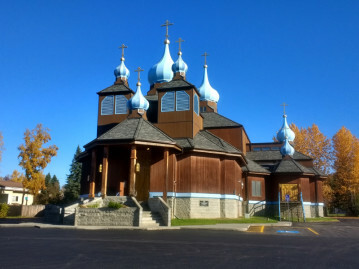 During its relatively brief history of 33 years, St Innocent Cathedral has seen the canonization of St Yakov Netsvetov, hosted numerous visiting hierarchs and delegations, and become one of the most prominent architectural monuments of the city of Anchorage. The parish has a diverse membership, including Russians, Greeks, transplants from the lower 48 states and Native Alaskans of Aleut, Alutiq, Yupik, Athabascan, and Tlinget descent. While English is the primary language of the liturgical services, Slavonic and native languages are also employed in our worship. Services were held at various locations in the city of Anchorage during the early 1960s by Fr Michael Oskolkoff who was also in charge of several other parishes in the South Central Region of the state. As the city grew it became increasingly clear a priest just for Anchorage was needed. On September 7, 1967, Priest Nicholas Molodyko-Harris and his young family arrived in Anchorage to form a parish in the city. Services were held at first in a facility owned by the local Greek community. Through the efforts of the fledgling community and the generosity of their hierarch, Bishop Theodosius (now Metropolitan), the current property in the Muldoon area of Anchorage was purchased.